It was a fun day out with people who share our passion for improving the health of babies. There were family teams, company teams and people walking with friends - it was a great feeling knowing we're all helping real families. Our thanks goes out to Izzy and Lizzy for making it a successful event. NEW YORK, NY, Sept 14, 2014 -- World Logo LLC has been selected for the 2014 Best of Alpharetta Award in the Advertising & Promotional Services category by the U.S. Commerce Association (USCA). The USCA was established to recognize the best of local businesses in their community. The organization works exclusively with local business owners, trade groups, professional associations, chambers of commerce and other business advertising and marketing groups. Our mission is to be an advocate for small and medium size businesses and business entrepreneurs across America. ALPHARETTA September 27, 2013 -- World Logo Llc has been selected for the 2013 Best of Alpharetta Award in the Promotional Services category by the Alpharetta Award Program. Various sources of information were gathered and analyzed to choose the winners in each category. The 2013 Alpharetta Award Program focuses on quality, not quantity. Winners are determined based on the information gathered both internally by the Alpharetta Award Program and data provided by third parties. The Alpharetta Award Program was established to recognize the best of local businesses in our community. Our organization works exclusively with local business owners, trade groups, professional associations and other business advertising and marketing groups. Our mission is to recognize the small business community's contributions to the U.S. economy. IN THE TOP 10% VIEWED PROFILES ON LINKED IN. 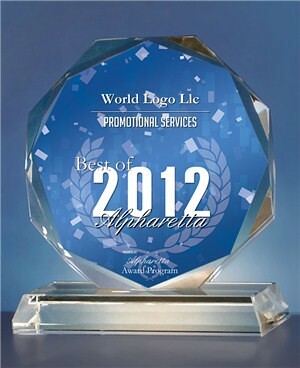 Earlier this year World Logo was recognized once again when they were selected for the 2012 Best of Alpharetta Award in the Promotional Services category. Various sources of information were gathered and analyzed to choose the winners in each category. The 2012 USCA Award Program focuses on quality, not quantity. Winners are determined based on the information gathered both internally by the USCA and data provided by third parties. "Our selection of your company is a reflection of the hard work of not only yourself, but of many people that have supported your business and contributed to the subsequent success of your organization." Congratulations!!! Wow, four years in a row. Great job! The USCA "Best of Local Business" Award Program recognizes outstanding local businesses throughout the country. Each year, the USCA identifies companies that they believe have achieved exceptional marketing success in their local community and business category. These are local companies that enhance the positive image of small business through service to their customers and community. Various sources of information were gathered and analyzed to choose the winners in each category. The 2012 USCA Award Program focused on quality, not quantity. Winners are determined based on the information gathered bothinternally by the USCA and data provided by third parties. NEW YORK, NY, July 14, 2010 -- World Logo LLC has been selected for the 2010 Best of Alpharetta Award in the Advertising & Promotional Services category by the U.S. Commerce Association (USCA). World Logo Nominated For U.S. Chamber of Commerce Small Business Dream Big Award. World Logo has been nominated for the US Chamber of Commerce DREAM BIG Small Business Award! This year the chamber has received a record number of nominations. Stay tuned - the winners of the Blue Ribbon Small Business Award® will be announced March 1. All Blue Ribbon winners will be eligible for the Community Excellence Award, selected by popular vote. Online voting will begin March 1 and close March 12. The winners of the Community Excellence Award and the DREAM BIG Small Business of the Year Award, sponsored by Sam's Club®, will both be honored at America's Small Business Summit on May 18, in Washington, D.C. The Small Business Commerce Association (SBCA) is pleased to announce that World Logo has been selected for the 2009 Best of Business Award in the Advertising, promotional, and trade show services category. WASHINGTON D.C., June 8, 2009 -- World Logo LLC has been selected for the 2009 Best of Alpharetta Award in the Advertising & Promotional Services category by the U.S. Commerce Association (USCA). U.S. Commerce Association (USCA) is a Washington D.C. based organization funded by local businesses operating in towns, large and small, across America. The purpose of USCA is to promote local business through public relations, marketing and advertising. The USCA was established to recognize the best of local businesses in their community. Our organization works exclusively with local business owners, trade groups, professional associations, chambers of commerce and other business advertising and marketing groups. Our mission is to be an advocate for small and medium size businesses and business entrepreneurs across America. 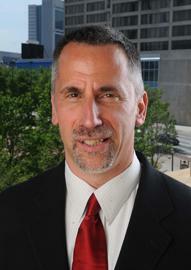 Jeff Albert Selected As Top Five Finalist For Small Business Person Of The Year! “Jeff is one of our life coaches,” said Gregg Kennard, executive director of Nspire Atlanta Outreach. “The most important thing Jeff does is give them some practical tools in self-image, self-confidence, and goal-setting in that path to the better life they want. He offers very real action steps to put that plan in motion.” Albert, who has been working with Nspire for about 18 months, has a certified professional coach practice with his wife, Leanne. Already, eight individuals under Albert’s tutelage have graduated from the 12-month outreach program, Kennard said. One of the graduates is a man who got his master mechanic’s license at a local technical school and is now employed full time at a car service station, Kennard said. Business philosophy: "Insanely Aggressive Customer Service and Satisfaction". World Logo Recognized In PMDM Magazine - Top 50 Small Distributors. Ranked # 6 Nationally!! !